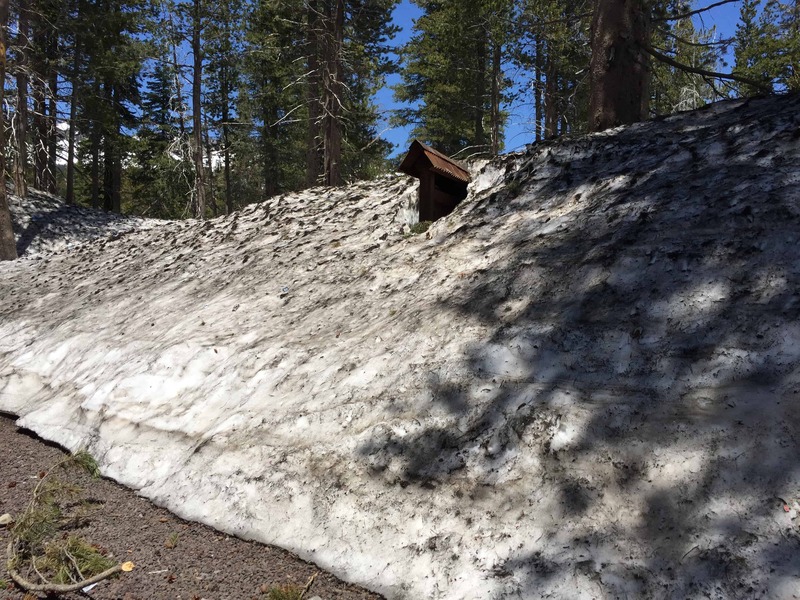 You might be thinking ‘why is he wearing shorts and hiking on snow?’ Well, there’s still snow on many of the higher elevation trails in Lake Tahoe and throughout the Sierra Nevada Mountains even though it’s 70 degrees during the day. What does that mean for summer hiking? Well, it can be dangerous if you aren’t prepared. Snow and ice covered routes make walking difficult and falling could lead to a long, uncontrollable slide resulting in injury or death. So let’s talk about how you can be prepared and safely navigate over ice and snow on trails. When you encounter a snow field covering a trail it’s usually packed down from people walking over it and more like ice, making it more slippery and dangerous. If you try to walk outside of the packed down trail thinking it won’t be as slippery it will widen the trail and might put you at a steeper slow and increase your risk of falling. We recommend carrying a traction device in your pack that you can easily slip on for safety. 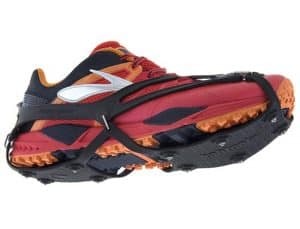 I am able to move more confidently and quickly if I put on a pair of traction devices like Kahtoola Microspikes when I hit a snowy patch of trail. 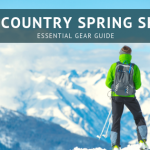 They are good on slopes up to 20 degrees and great for long distance hikers on the Pacific Crest Trail (PCT), mountain runners doing the Salomon Broken Arrow Skyrace and anyone who is going to go for a hike or run and might encounter snow. Expect snow on the trails at elevations above 8,000 ft well into July and even August this year. Kahtoola Microspikes are lightweight and durable traction devices with spikes that goes over your shoes or boots. 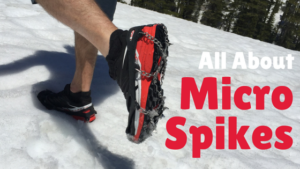 They are extremely easy to put on and use so you can confidently walk on icy or snowy trails, frozen lakes or any surface that is icy so you don’t fall on the trail or slide down a mountain. Microspikes have 12 spikes per foot, with 8 spikes in the forefoot and 4 spikes in the heel. Each spike is 3/8″ long and made from heat-treated stainless steel for excellent durability and corrosion resistance. 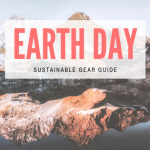 Each pair has flexible, stainless steel chains that attach to a stretchy rubber harness that you pull over your shoes or boots for a quick and secure fit. They pack down small fitting easily in a pocket or your backpack, weigh between 11 and 14 ounces and come with a tote sack for storage. With a relatively affordable price around $60 there’s no reason not to have these in your pack if you are planning an adventure in higher elevations where there might be snow and ice. Kahtoola’s NANOspikes have a less aggressive traction system compared to the Microspikes. Ultralight, low-profile flexible winter traction that lets you run across iced-over and snow-packed trails and streets—as well as on pavement—with confidence, and without affecting foot strike. They work just as well for parents or grandparents worried about slipping on ice or packed snow as they do for year-round runners that log serious miles. The design is durable, comfortable, and easy to use, while the low-profile platform is all but imperceptible (no pressure points or sore spots). If you’re in running shoes or minimalist hiking shoes, the size chart is accurate, but if you’re on the cusp or planning to put the NANOspikes on bulky hikers or full-on winter boots, size up. The system is available in small, medium, and large. 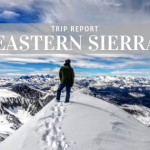 Check out this video for current snow conditions on the Pacific Crest Trail off of Interstate 80 at Donner Summit on the Pacific Crest Trail. This video is provides information on how to put on microspikes and how to use them. This is the trailhead sign for the Pacific Crest Trail (PCT) at Donner Summit. This is why it’s a good idea to carry a pair of microspikes in your backpack this summer. You never know when you’re going to come across a patch of snow and they will give you the confidence to keep moving along safely. Tell us about your summer plans in the comments below!